Let me first tell you that we greatly enjoyed sailing on your beautiful HASAY. My wife Ingrid, our daughter Nathalie, her two girl friends and me got a first class treatment. The Captain, his wife Hale and the sailor Ferat dit a perfect job. As soon as our grand children will know how to swim we will not hesitate to contact for a new charter. offers boutique hotel quality and comfort. She has 4 cabins for up to eight guests. There are two master -cabins and 2 double bed cabins (air-conditon all over) with ensuite bathroom with shower-cabin of highest standard. She comes fully equipped with VHF radio, GSM telephone, dinghy with outboard, stereo music system, canoes, fishing and snorkeling equipment, generator, inverter and continuous hot water. 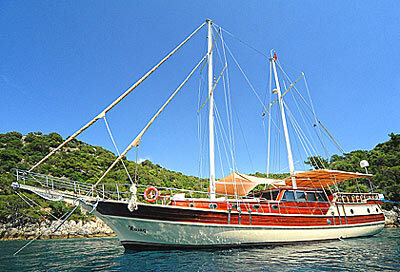 M/S HASAY has its homeport in Fethiye, ideal for Lycian coast cruises. Flights to Dalaman are recommended. Transfers can be arranged on request. Our Charter route generally follows a south westerly route along the spectacular Mediterranean Lycian Coast via coastal towns and villages such as Kekova and Kalkan. A stop is usually made at Olympos, an ancient site which is very well preserved and holds many fascinating ruins (Chimaera with its flames is close) while further along the Lycian coast we travel to Kekova, a beautiful and picturesque area with many underwater marvels from its ancient past. The final route can be at the wishes of the clients in consultation and agreement with the captain. M/S HASAY has a very experienced crew of three. Our Captain has 30 Years experience on Charter Gulets in these waters; his cook is a renowned Chef as well as a very experienced sailor. They will bring to you all the delicious dishes, the Turkish cuisine has to offer. More on food on board here. The Captain speaks very good English. A third crewman is also on board. The crew and boat of course are fully licensed and insured. Comfort/Recreation: Spacious sun deck area with 10 sun mattresses and cushions, Sun awning, spacious dining area with bar and dining table. All inclusive service 55,-/65.- Euro per Person / per day. En Suite bathrooms with shower cabins. Flybridge with spacious sun deck area with mattrasses and cushions, sun awning, cushioned aft deck with a large table, deck chairs, spacious saloon with bar and dining table, audio equipment, color TV, DVD player, snorkel and fishing gear, and one canoe. The M/S HASAY meets international safety regulations including life jackets, fire extinguishers and alarms.